Quick report, but wanted to give an update. Guided on Friday for steelhead and trout, and the fishing seemed promising in the beginning of the day, and ended up with a high water surprise. When we started, we were fishing a river that had been dropping for a long period of time, and was finally at a good fishing level. The last time I guided there, the fishing was very good, and it should have only been better than that day due to the time frame in the spring. We started out with nice conditions, and the trout were biting with some regularity. It seemed that the trout fishing was going to get better as the day went on, and the steelhead on the end of the line was going to happen due to the inevitability factor. When you swing your flies through probably holding lies, and the fish runs are banging with high numbers; it is only a matter of time before a chromer staples itself onto the end of your line. The reality turned out to be quite the opposite. I was noticing water in the willows, and the currents and hydraulics were getting rather intense compared to the norm on this float. I was saying the water seemed way too high for the reading on the river level gauges. 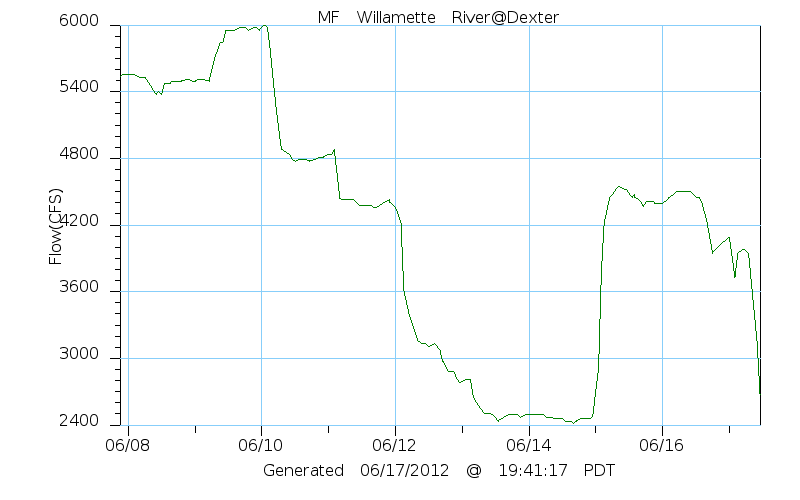 At the end of the trip, I observed on my cell phone that the levels did spike up. When you have a .7 of a foot of water level rise; it couldn't mess up the fishing anymore than many other variables. Think of a fish holding in a spot that has a walking speed current; only to have that spot minutes later become a fast steady running speed. Steelhead would think move upstream with the freshet; while trout would think take cover while the storm is hitting. 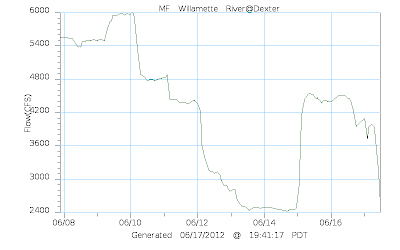 It is amazing how they can fluctuate river levels so much without taking that into consideration. Spey rods enable long casts in spots where three steps off the bank would be dicey to wade. Saturday was the opposite for results, and it was due to a decision change in the plan. I contacted my clients and let them know about the sudden raise in water level. We ended up fishing for trout only on the McKenzie, and it was really good fishing. One of the clients was in his "learning how to fly fish" phase; while the other was his father who was enjoying watching his son fly fish. The father told me how he just wanted the focus of the trip to have his son learn about fly fishing, and to hopefully get the best action possible. Well the fish gods certainly gave the dad his father's day gift. The son caught many fish throughout the day, and they ranged from small cute little trout to fat pig wild native slabs. He really picked up the techniques very well, and by lunch I lost count of the grabs and fish on. It was a really fun time to see the guy in the front of my boat torch so many rainbows throughout the day. Most of the spots produced just like they should on a good day of fishing, and the first 1-5 presentations were the ones that got the most attention. The water level was pretty much perfect, and fishing conditions were really nice with a light breeze, filtered sunshine, and some clouds here and there. Fishing with a Chubby Chernobyl Norm and a possie bugger dropper was a total hit. Also swinging wet flies (green riffle diver and a green wired soft hackle) were very effective. Sudden drop offs where the water went from shallow shelves to the deeper green were the best spots all day long.